It&apos;s American Craft Beer Week! 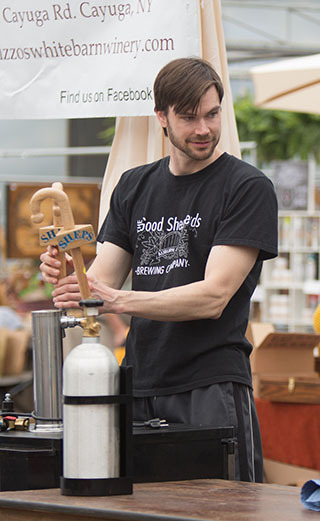 In celebration of the week we are featuring a special Q&A with Garrett Shepherd of The Good Shepherds Brewing Company. Garrett and his story are a perfect fit for American Craft Beer Week as they embody what craft beer is all about! We are excited that Garret was willing to share his story of some rather humble beginnings (starting off as one of the smallest breweris in the state back in 2014) and cannot wait to see them grow! 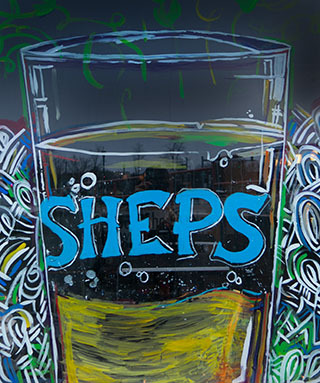 Cayuga County wants to put a shout out to all of the small and independent craft breweries not only in our county but in the entire Finger Lakes Region! So be sure to stop into your favorite local brewery from May 16-22, 2016 and make a toast to the week! Tell us a bit about your brewery? Well we are proudly Cayuga County’s first brewery to open since Prohibition. (1918). When we first opened our doors in September 2014, we were one of New York’s smallest brewery but since have expanded to put us around 100 barrels of beer per year or about 310 gallons of beer per year. Our batch size is typically 2.5 barrels of beer per batch or 75 gallons. At this time I have 7 fermenters and 2 bright tanks where I carbonate the beer. We are a family run organization and truly enjoy being that way. I have been brewing for over 15 years. I got into brewing after my father in law, Tom Stamp, brought us down 5 gallons of Owen Orchard’s apple cider to North Carolina. We drank the first one and wasn’t sure what to do with the rest. He told me some people make hard cider out of it so I bought a small fermenter and some yeast and made hard cider out of it. After tasting the cider, I said if that went well, let’s try to make some beer. After years and years of home brewing and attending brew school, my father and I discussed and put our efforts into starting our brewery. I think what I enjoy most about brewing is the freedom and variety of beers we all can make. There are so many variables in brewing that 5 people can use the same ingredients in making a beer and each of the beers can come out so different. I wouldn’t say I don’t enjoy but owning and running a craft brewery is a lot of hard work. There are days where everything seems to go great but as we all know there are also days where it is going to be a hard day. But the nice part is that each day brings something different. The steps I take when creating any new beer is that I do as much historical research into the style and immerse myself into the techniques, hops and malt used, as well as water and temperatures used to create that beer. I then take those guidelines and put my own spin on them and decide to keep it traditional or make it more new school. How I decide what to brew or what next to brew depends on how I am feeling or I also take ideas from my regulars. Recently, I even did a voting where customers came in and voted on the beer they next wanted me to brew. It was really a lot of fun. I think what attracts most people to my beer is the variety of beers I create and coming back for those flag ship beers that people enjoy like my Sunrise IPA or the Auburn Amber Ale. Which of your beers is your favorite? Have you had any outright disappointments or disasters? My favorite beer I brew is probably my Sunrise IPA. I am an IPA guy at heart and especially getting into the summer months, that beer is just so nice and smooth. People really seem to enjoy it. My plans for the future are to continue to expand the business as a brewery and continue to put out good consistent beer in the community. I love having new people stop into the tasting room as well as greeting my regulars by name at the brewery. What advice would you give to home brewers? Keep brewing and keep brewing the same beer till you think you have it down. That is what our industry needs is people who are quality driven and can work well when problems arise. Also, all of us brewers enjoy trying some home brew especially when you think it came out as planned. 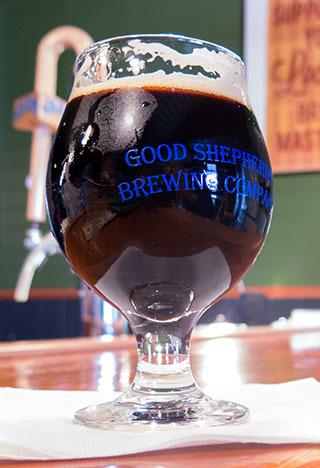 Looking to visit The Good Shepherds Brewing Company? Hours: Tuesday - Thursday 4-7PM & Friday 4-9PM, Saturday 2-8PM.